Erica Schultz continues to shine for Gail Simone's 'Swords of Sorrow' event at Dynamite Entertainment. 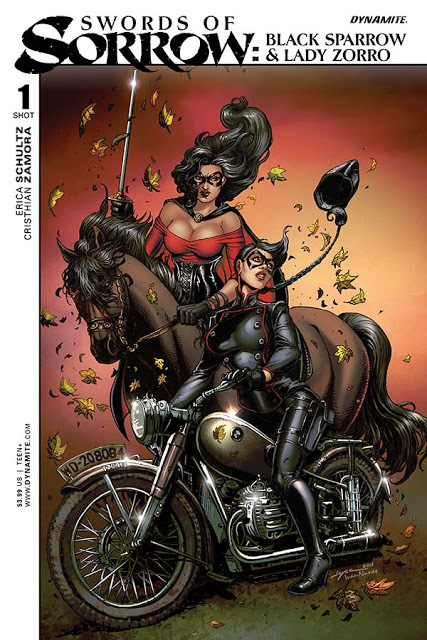 In this one-shot, Swords of Sorrow: Black Sparrow/Lady Zorro, Schultz brings together the latest dynamic duo of superheroines to collaborate in the name of defeating the evil Prince Charming's forces. It's the classiest team-up thus far with loads of prehistoric thrills and chills. Any ambitious comic book event involving so many different characters is an enormous undertaking requiring a ton of exposition and character development in a short amount of time. Some of these heroes are new to audiences and having them team-up and work together takes some expertly crafted storytelling. Luckily, Schultz handles the rigors of introducing the characters, establishing a cohesive narrative, and finding camaraderie between them seemingly with ease. After stealing a mysterious stone and a visit from the Courier in 1940 Spain, Black Sparrow is thrusted into the nineteenth-century world of Lady Zorro's California. Danger looms everywhere, but Sparrow's reaction to meeting Lady Zorro was extremely charming and endearing. She's in awe meeting the legendary swordswoman in person. Here you have a congenial meeting of two extraordinary ladies from different times but from Spanish-speaking countries. They share a bond and have mutual respect for one another. It's one of the best collaborations in 'Swords of Sorrow' so far. With all that said, there is plenty of action and near-death challenges as they try to keep one step ahead of the Prince's minions from getting that mysterious stone. Both of our heroines are up to the challenge even as treacherous as their journey becomes. It's a fantastic prelude to the battle that will take place in the main 'Swords of Sorrow' book. Cristhian Zamora's pencils and Salvatore Aiala's colors bring a bold magical composition of explosive shades of hues and detailed linework. All the while, the layouts provide the right foundation for the swelling action that steamrolls to the end. The artists created a pulp adventure in classic fashion but with the shine and vibrancy of modern comics. Swords of Sorrow: Black Sparrow/Lady Zorro is a special one-shot indeed. It brings together two formidable heroes without an ounce of cynicism or competitive rivalry between them. The two work fantastically as a team to fend off threats throughout the issue. If this doesn't make you want to pick up past issues of the respective heroes I don't know what will.